It’s once again time for Comic-Con, held in San Diego, and it’s there that comic book artist Mike Mason has come to present a Lifetime Achievement Award to his deceased mentor, Benjamin Kurtz. Mike is a nomad of sorts. This con will be different, however, for Mike will halfway reconcile with his ex, Christine, and be accused of killing the man who took her away from him and was responsible for their divorce. When Danny Lieber is found stabbed, everyone, including Christine, believes he did it, and when everyone has that kind of faith in him, Mike is definitely on his own, or is he? There may still be a couple of staunch fans who’ll be glad to help out their favorite comics artist, even if it’s dangerous. After all, Mike’s brought them thrills aplenty with his drawings and storylines. Why shouldn’t they return the favor and help him elude two cops who could be straight out of someone’s old comic? Soon, however, there are more bodies and more alibis are needed, and it’s possible that at the bottom of it all, are some of Benjamin Kurtz’s now-ancient comic book boards. This is a delightful read. Filled with smart retorts, sharp descriptions, and the frantic, chaos-filled atmosphere inherent in all cons, it makes that venue come alive, even for those who’ve never been to such an event. Peppered with television, movie, and comic book references, the convention fan will find himself immersed in well-known surroundings, while the less familiar reader will nevertheless enjoy the satirical tone of the story. Those who’ve read the author’s Ten Dead Comedians will recognize the same ironic style, though this story has a more harried and pandemoniac quality because it is, after all, set in a world where fantasy and make-believe is the norm and reality can only be actual if it’s surreal. With sketches ostensibly made by narrator Mason but in actuality done by illustrator Tom Fowler, this story leaves little to the imagination and nothing more to be desired. 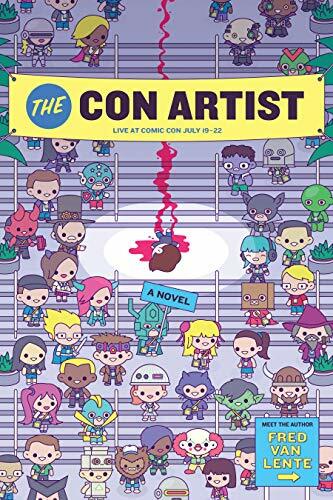 Read The Con Artist and be transported to a world where superheroes and villains, dungeons, dragons, the Final Frontier, and everything in between, exists for everyone in attendance.